Gabe Sanchez of The Black Swan Saloon. 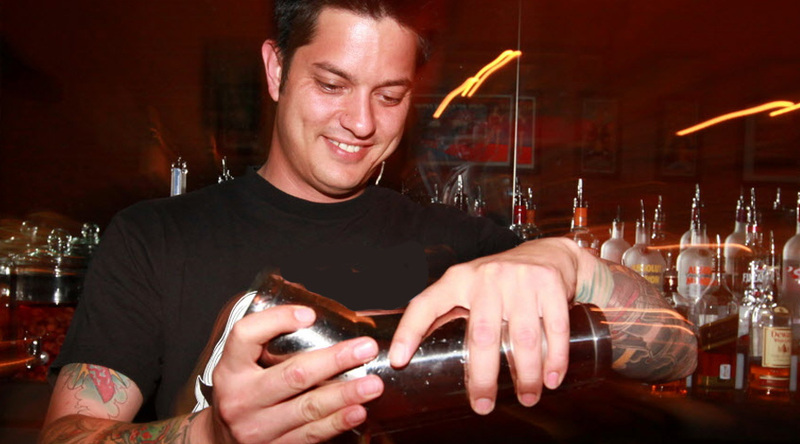 With years of experience delivering VIP experiences to celebrities in Las Vegas nightclubs, Gabe Sanchez opened The Black Swan Saloon to provide VIP-level service in a neighborhood setting. He wanted to create a place you’d have to be “in the know” about to visit — but, once you’re there, you’ll feel welcome right away. Since opening in 2010, The Black Swan Saloon has become a favorite of Dallas locals, tourists, foodies and even bartenders, garnering glowing reviews and winning awards from Dallas Observer and D Magazine. Famous for its craft cocktails made with house-infused fruit liquors, it’s been described as a hidden gem — it literally has no storefront signage. Sanchez selected Deep Ellum to open his business because of what he had learned about its history and uniqueness. The Black Swan has no menu — instead, bartenders mix custom concoctions on the spot, using local, in-season ingredients whenever possible. Simply share your favorite spirits and flavors, and prepare to be amazed. Sanchez buys fruits and vegetables from neighborhood markets, chops them by hand, and mixes new batches of fruit-infused liquors each week. His favorite flavors? The Black Swan Saloon may be tough to find — but it’s well worth the effort. For a listing of all the great places to enjoy a drink in Deep Ellum click here.